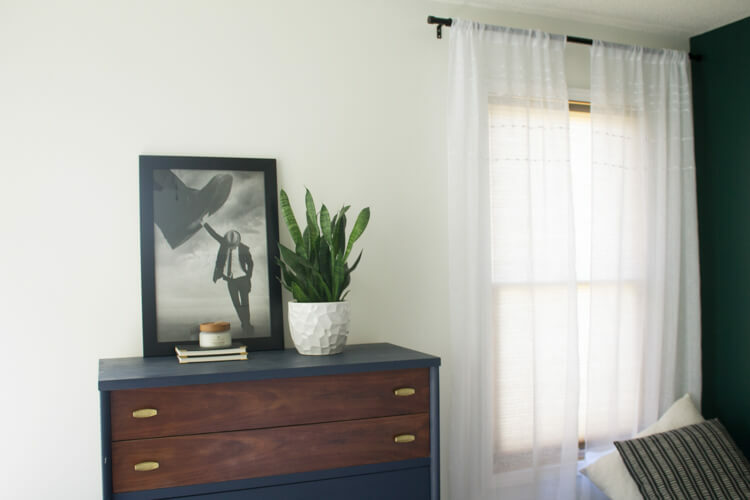 Thank you iSense Sleep for sponsoring this post about how to decorate your bedroom for better sleep. Find my full disclosure here. This post also contains affiliate links. When I’m busy decorating, sometimes I get caught up in following the latest trends and wanting to add everything I love on Pinterest to my home. While it’s certainly fun and we should all do our fair share of that, it’s also important to think about how your home functions and feels. This has never been more apparent in any room of my home than my bedroom. Of course I want it to be beautiful, but I also want it to carry out it’s main function – provide me with a relaxing place to sleep well. So today I want to share what I’ve learned about how to decorate your bedroom for better sleep. The paint on your walls and the decor you choose is going to be a huge factor in determining the feel of your bedroom. There’s not one particular direction you have to go here. 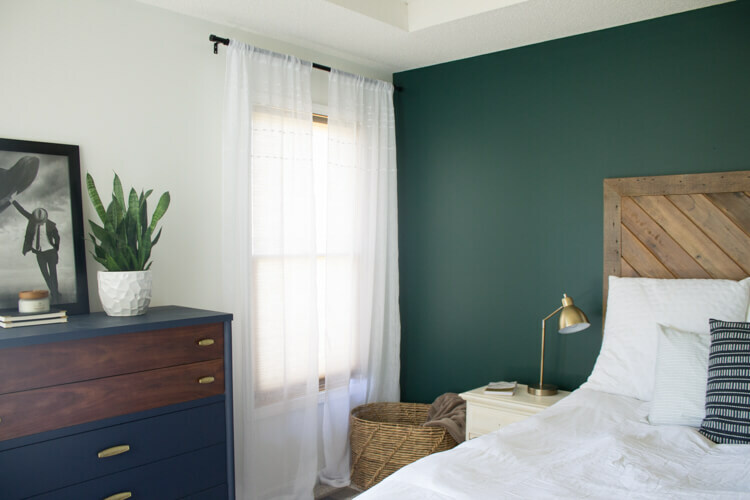 I’ve had soft Sea Salt painted walls that were super soothing and now we have a bold, dark wall (Valspar Peacock House) that also creates a different kind of calm. Work to identify what colors relax you and put more of those in your bedroom! Keep your decor minimal, but functional. It’s so easy to overdo the decor in a bedroom! Originally I had a large fiddle leaf fig in this corner which is what I had always envisioned there, but in real life it took up too much space. The shape and shadow of it kind of freaked me out at night and that did not help my sleep. Although my fiddle leaf fig didn’t work in that corner, plants are a great way to minimally decorate your bedroom. And bonus, they clean the air. You can see my snake plant on the dresser. I love how much texture it adds to the room! Fake plants are a great option for the corners of your room that might not get much light. 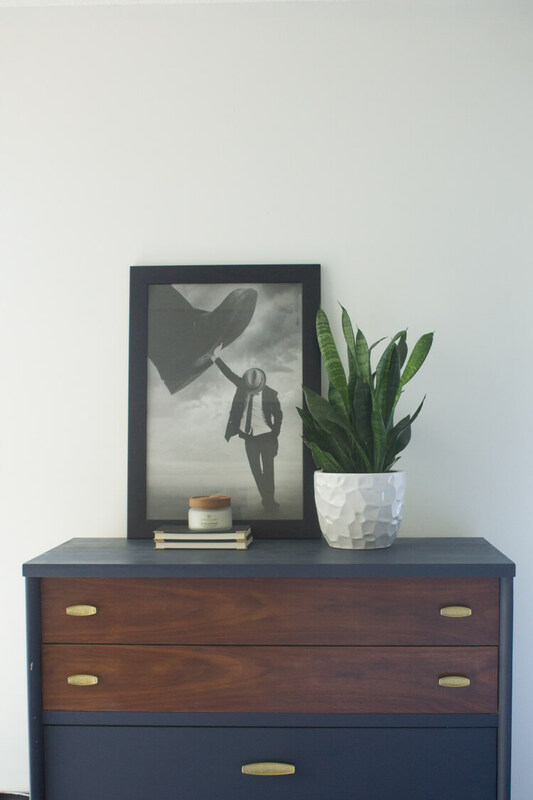 When you’re putting art on the wall – try to come up with fewer, bigger pieces so the space is still filled, but isn’t cluttered with lots of small things. You can also add some fun personality with the stuff you do need, so your bedroom doesn’t have to be boring. 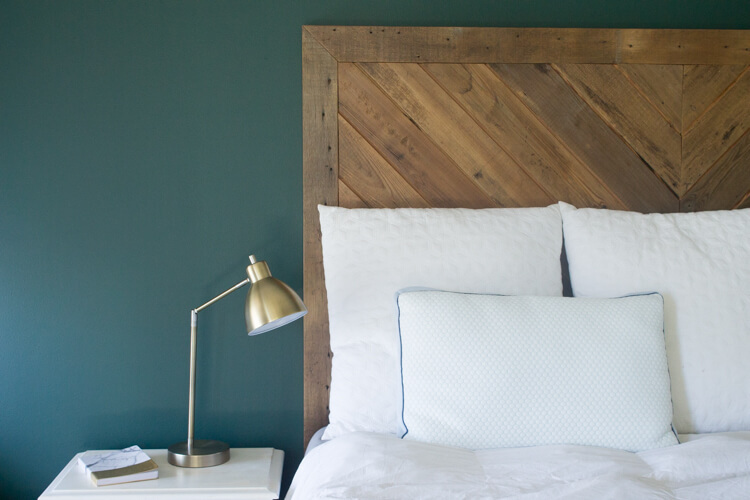 Try packing a big punch with your dressers, headboard, nightstands, and bedside lighting. And don’t forget you can always replace the light on your ceiling if you have one. Minimal decor doesn’t mean it has to be boring! Try not to use your bedroom for storage. If you had your own room growing up, you probably kept most of the things that were yours in your room. 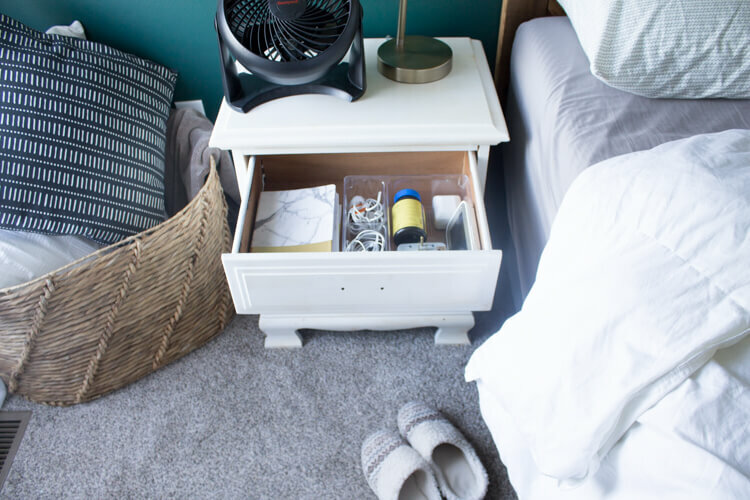 It’s so much more relaxing if your stuff has a home outside of your bedroom so you can avoid the clutter and stress that comes with it! Nightstand drawers can be particularly troublesome. I recently went to HomeGoods and bought a simple drawer organizer to shape mine up. Now I’m only keeping things in there that I use right around bedtime. Everything else found another home. So chargers, a baby monitor, my ring box and a couple books. It’s so much less stressful to have all those cords contained! Baskets are a great way to contain decorative pillows you aren’t using overnight. During the day you can use them for any blanket you like to sleep with but don’t want on your bed. And they add lots of great texture to your room too! Figure out which type of window treatments you need. Did you know that any amount of light can disrupt our natural sleep patterns? Of course we’ve all probably heard this, but I didn’t really pay attention to it until I had a baby. Maybe because sleep became less frequent and more cherished? But now I know if I want to fall asleep fast, creating a dark room is best. I also noticed my 2 year old wakes up more if there is any light in his room. We even cover the light on his sound machine! For our bedroom windows, we have accordion blinds and curtains. The accordion blinds aren’t necessarily the most stylish, but it’s what the owners before us used and they come in all different levels of sun blocking. My son has the black out ones and they work great, and he sleep so much better! Curtains can really soften the look of your windows and make your room feel more breezy and relaxing. I don’t have curtains in every room of my home but I think they’re a must in a bedroom! I’m in love with these modern curtain rods from Amazon! Invest in nice pillows and linens. The pillows and blankets on your bed are the most fun way to decorate your room. 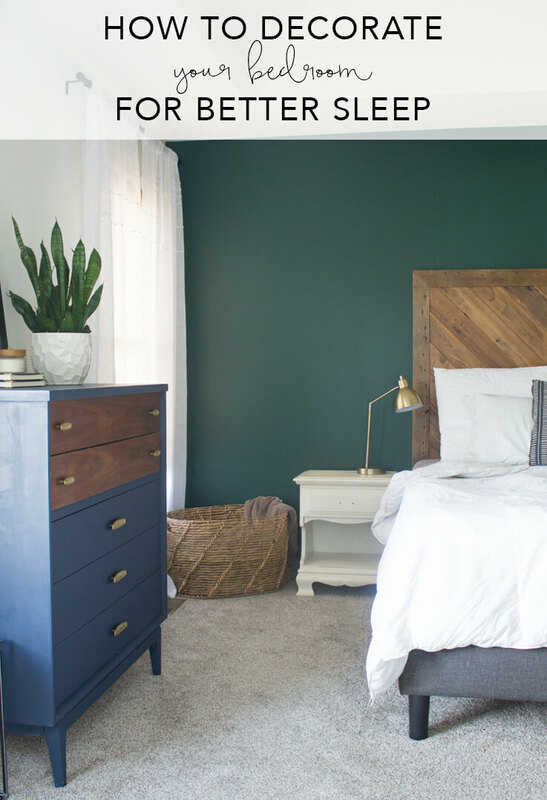 If you’re like me and like to keep everything else simple (with a statement headboard of course! ), this is the best place to mix and match colors and textures for a cozy room! As far as the actual linens go…we won’t get into the top sheet vs no top sheet debate today. But I noticed people mentioning their comforter is itchy or uncomfortable, so that’s why they need one. WHY would you live your life with an uncomfortable comforter? You’re supposed to be spending 1/3 of your day there! Get yourself some nice soft linens and blankets that are both nice to look at AND feel nice. And you really should invest in a good quality pillow while you’re at it. Confession: I’ve spent the last year or so sleeping on a decorative pillow. We registered for “nice” pillows when we got married and were gifted them, but I had no idea how to pick out a pillow back then. So mine was way too firm and gave me headaches. About two weeks ago I started using the iSense Sleep Smart Pillow and it has been life changing! Unlike the pillows we had before, this one is completely adjustable. It’s filled with memory foam pieces that you can easily remove to give you full control over the height, but with the level of support you need. You know, support you don’t get from a decorative pillow. The outer layer of the pillow is filled with cooling gel beads so it never gets hot and I’m constantly checking it to see if it’s still cool. Always is! And none of that stuff is even why the pillow is smart. The iSense Sleep Smart Pillow also comes with a sleep tracker that fits in a pocket inside the pillow and connects to your phone. It’s similar to sleeping with a fitbit, but the charge lasts for 2 weeks and you don’t have to have it attached to your wrist all night. There is so much you can do with this app – it provides weekly sleep reports with feedback and tips, it has a soothing alarm you can set and sleed aid music, like white noise. Pretty cool! I’ve learned that my sleep quality is terrible and I’m actually logging too many hours of sleep. Every night my husband asks when he’s going to get a turn and is disappointed he doesn’t have one too. We may have to change that soon! :) The pillows are available on Amazon here, but head to their website to get all the info on their smart technology! 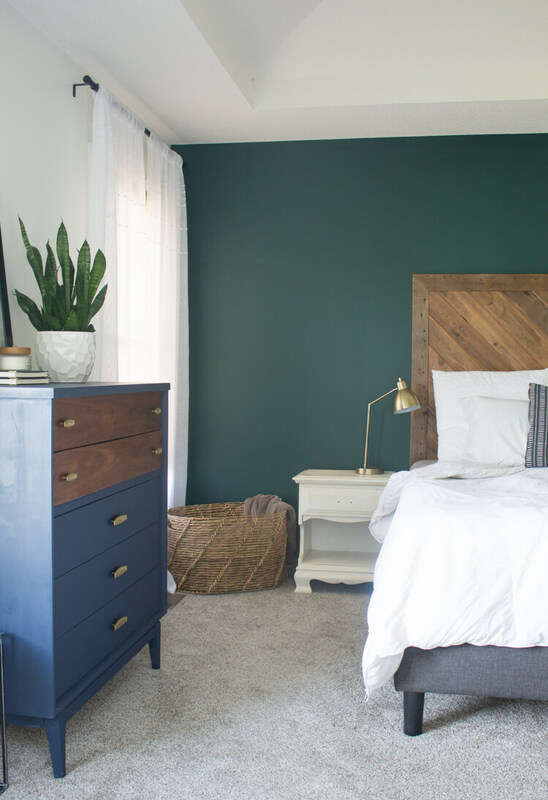 Alright so there you have it, my best tips for how to decorate your bedroom for better sleep! Like everything else on this minimalism journey, less tends to be more. Thanks, Diego! You definitely should!